This summer, I signed Zack up for three camps. So far, his favorite hands-down has been his day camps at The ClayBakers. Rather than do a full week of camp, he goes for a random six days throughout the summer for a couple of hours to do a specific project. He's loved it. Zack is six. And I couldn't be prouder. I am so hoping that his love of art -- all kinds of art -- continues throughout his life. We have a craft closet to rival any store, and Zack has experimented with everything from paint to oil pastels. Obviously, I hope he continues to love glass, because as soon as he's old enough, I want to teach him how to make beads. He's already telling me that he doesn't want to go to college but wants to go to art school, but only if I go with him, and I have to say, I'd love to go! There is so much I'd love to learn, so much YET to learn. The future this boy has. He amazes me every day. Oh WOW! I'm jealous... I want one! That is gorgeous! What a little artist you have. :) Perhaps he'll have an Etsy shop of his own soon! Wonderful work, such vibrant colours!! That's such a gorgeous piece! It's so cool he has a growing interest in art. That's just awesome! I always wanted to go to art school, but my mother said, go to college first, then art school. I often wonder how my life might be different if I had actually gone to art school. I'd probably be doing the exact same thing I am doing now! Anyway, it's nice your son is artistic and that you encourage him. And i love what he made. I's just beautiful. WOW!!! The boy has an eye, that's for sure. That's beautiful Lori, please tell Zach, he's a little Picasso in the making and I think his work is wonderful!! Thanks for sharing. Absolutely fabulous!! He did a great job! Definitely artistic! What a cool camp idea! 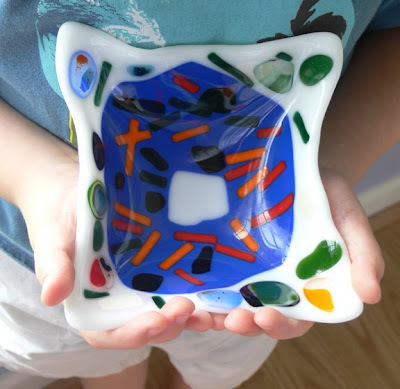 Zack's fused piece turned out so colorful...what a treasure to keep. And you'll remind him one day that he made it when he was only 6! That is stunning! How wonderful it would be if his wish for you to learn together would come true! Oh, how cool is that? Yes, you do need to go to school with him. he did a lovely job! Who Hit Me With a Sledge Hammer? Book Review -- Maeve Binchy, "Heart and Soul"
Love Jewelry? I'm Updating the Web Site!